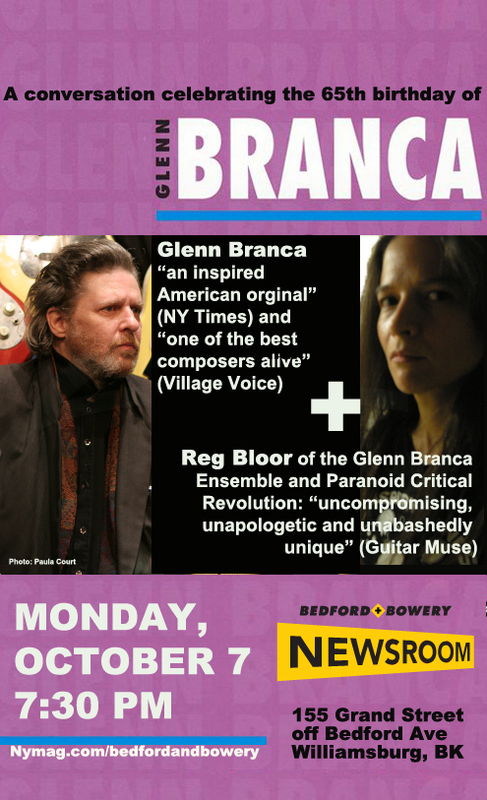 There was a lot of fuss about Philip Glass’s and John Zorn’s recent birthdays, and we’re not going to let the birthday of another legendary downtown composer, Glenn Branca, go without a similar amount of hoopla. This is, after all, the iconoclast who, with his band Theoretical Girls, helped spearhead the No Wave movement in the late ’70s and who mentored Sonic Youth’s Thurston Moore and Lee Ranaldo back when they were members of his guitar orchestra, belting out what John Rockwell of The Times described as “music of massive sonic grandeur.” That’s why we’re inviting you down to the Bedford + Bowery Newsroom on Monday, October 7 — the day after Branca turns 65 — to ask him anything. On this very special occasion, Branca will be joined by his wife, Reg Bloor, who plays guitar in his ensemble and in her own band (The Paranoid Critical Revolution plays Trash Bar, just down the street from our Newsroom, tonight at 9 p.m.; there’s an open bar on well drinks and PBR an hour before their set). Bloor is one of hundreds of musicians who’ve been a part of Branca’s “guitar army” over the years, helping him produce hallucinatory, cacophonous, mind-melting symphonies that stretch the boundaries of both rock and modern classical music: others have included Michael Gira of The Swans, Page Hamilton of Helmet, Wharton Tiers, and Phil Kline, best known for staging “Unsilent Night” in the East Village every year. It’s impossible to gauge Branca’s influence over the past four decades, but we’ll try to do just that on Monday. Join us at 155 Grand Street, just off of Bedford Avenue in Williamsburg, at 7:30 p.m. The Q&A is free, just let us know you’re coming.